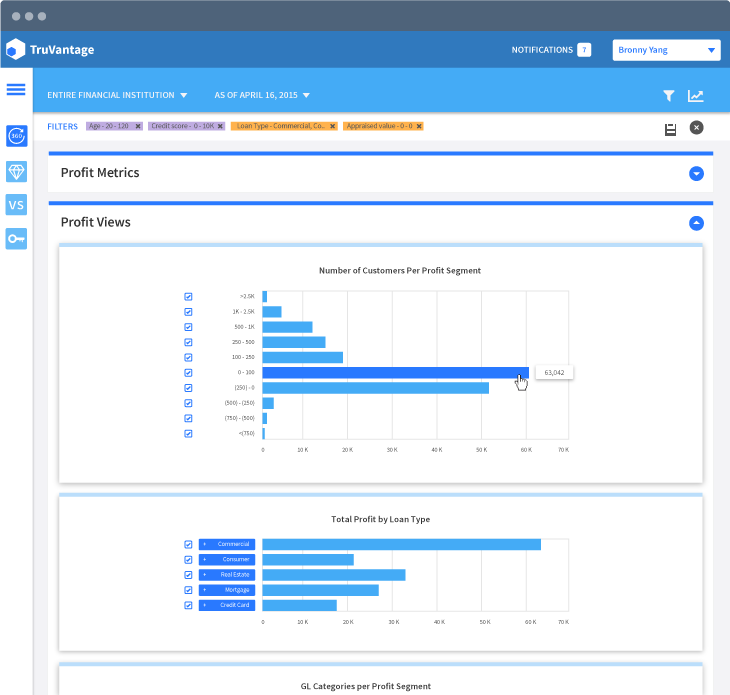 TruVantage™ consists of a suite of modules that allow you to collect and analyze the data you need to make informed decisions. 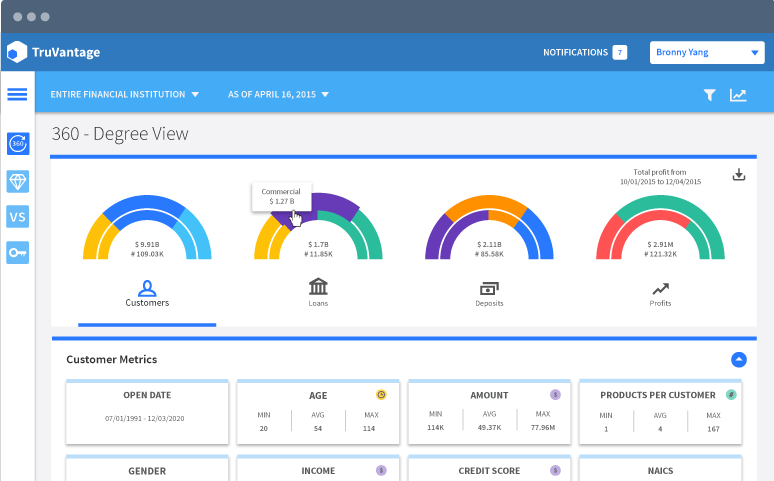 The product has a well-defined roadmap, and we have the ability to develop custom modules to suit an individual financial institution’s needs. TruVantage's revolutionary modules accelerate your journey to the summit, driving cultural transformation as the system becomes widely used and holistic within your institution. 360° View delivers visibility into the performance of your centers of influence (COI), relationships, customers, loans, deposits, and profit. The dashboard is fully customizable, and depending on the size and type of your institution, we can add more dials as necessary. You can easily filter this data to get the information you need to enable more informed decisions. And a time tracking elements allows you to visualize how different metrics compare at different dates, and compare trends over time. TruVantage’s Value Finder identifies specific customer segments where there is untapped potential for opportunity. For example, an opportunity to cross and up-sell customers without a debit card, or mature mortgage holders without an equity loan. 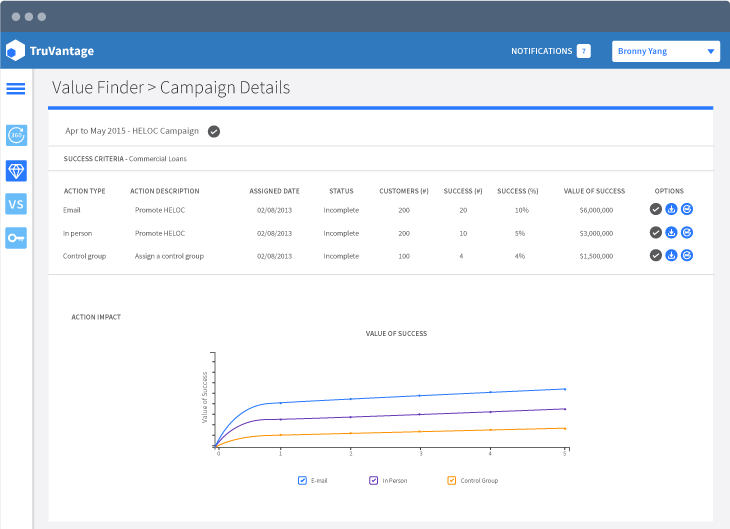 Value Finder can also establish multiple data groups and compare results over the long-term, helping you understand which campaigns, sales opportunities or cross-sell initiatives have the biggest impact. Over time the product, through the use of advanced analytics, will be able to help you identify other segments of opportunity by applying statistical models on historical behavioral data. 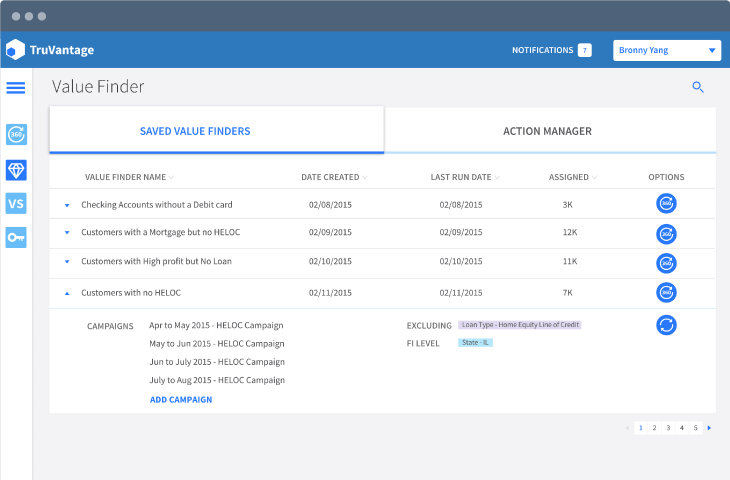 Action Manager is a truly game-changing module that takes TruVantage™ beyond predictive analytics. Its prescriptive recommendations help you create a new action for an identified group of customers, time stamp it and track its impact. With Action Manager, you can focus your efforts on the most promising opportunities, resulting in an immediate and sustainable boost to revenue or business goals. Action Manager helps your organization incrementally develop best practice by comparing performance of different actions against a control group. Battle allows senior management to compare and manage performance on a branch vs. branch, region vs. region, officer vs. officer or product vs. product basis. It delivers impactful and sophisticated comparisons at a glance, informing strategic decisions such as where to invest. The Profit module is a central component of the TruVantage™ product. It calculates profitability at the account, customer, product, officer, branch, region and financial institution level. The module has sophisticated FTP, direct, activity, and transaction costing, and spreads general ledger accounts based on a number of metrics to tie to the income statement. It has capital costing and risk-weighting, and expresses both above-the-line and below-the-line profit. The module integrates profit calculations into your incentive plans to drive strategic decision-making. This module delivers a quantified metric that can be used in Action Manager and Value Finder to focus cross-sell efforts to either improve retention on your best customers or offer the right product at the right time to other customer segments. The metric also provides valuable insight on how different segments are trending or an early warning of an issue with an individual customer. With Key Metrics you can quickly identify the main factors that drive success at your institution. With a high level snapshot of the most essential metrics, you can quickly understand and react to the factors influencing your revenue. The module enables you to instantly drill down and see your key metrics across all levels of your institution. Admin allows you to control, restrict and monitor access to your TruVantage™ portal, and designate which employees have access to different sets of data. For example, while C-level executives will be able to access complete profitability figures, other employees may only be able to see each customer’s profitability as a rank or percentile. Admin also handles security and helps ensure TruVantage complies with customer data regulations. TruVantage will help you rise above your competition.